Advent is nearing. Christmas is coming. And I am already feeling the tug to hurry and strive and stress about all the things. But Advent invites me to slow down. Advent asks me to simply rest and remember. Advent is a season of preparation in anticipation of the arrival of Christ. It’s a season to rest in His presence and remember His story. It’s a season of expectation and hope…a season to intentionally celebrate the coming of our Savior. I didn’t grow up really observing Advent. We celebrated Christmas, for sure…in big and beautiful ways. It has always been my most favorite time of the year. But our church tradition was not particularly liturgical, and I honestly didn’t really understand what Advent even really was until just a few years ago when I studied the liturgical church calendar. It intrigued me, these annual rhythms of remembering the story of Jesus. I think there’s something to said for traditions that repeatedly remind us of the things that our wandering hearts can so easily can forget. The world provides many distractions for my heart…traditions remind me to slow down and take time to refocus and remember. As a family, we create traditions to serve as reminders for our hearts – because traditions help us remember. Traditions like baking cookies and decorating the Christmas tree, making homemade ornaments and decorating gingerbread houses, all are tied to years of memories. Even smells and sounds, like wassail simmering on the stove and Christmas songs playing on the radio, trigger memories from the past. And traditions like Advent help us intentionally remember the most important thing of all: the story of Jesus. I recognize that observing Advent is not by any means a requirement as a Christian. The Bible doesn’t exactly lay out the liturgical church calendar that is recognized my many churches today. In Leviticus, God did lay out an annual plan for His people, the Jews, to celebrate and remember through fasts and feasts every year. But there is nothing in the New Testament that commands us to observe a similar pattern of remembering. There is no rule that lays out exactly how all Christians should celebrate and remember the story of Jesus. I actually love learning all the different ways that believers around the world celebrate Christ at Christmas and throughout the year. The body of Christ is a beautiful mosaic of cultures and traditions. So, no, we don’t have to observe Advent, or even celebrate Christmas or Easter at all, I suppose. But we don’t celebrate these days because it’s something we have to do…we celebrate them because it’s something we get to do because of what Christ has done. Because Christ came and because He died and because He rose again, we get to celebrate! We celebrate freedom and hope and new life…because of Christ. And what better reason is there to celebrate?! A few years ago I experienced a really hard Christmas season. We were facing new challenges as a family, I was working full-time, and my schedule was spread thin. I was so busy, and still trying so hard to keep up and make Christmas special for my family. Every day was so exhausting. My to-do list was longer and larger than any day could hold. I actually couldn’t wait for the Christmas season to end because I was so tired and worn and weary. Christmas had always been my favorite season, but I honestly hated it that year. It was just too much work. Too much striving. Too much trying. I was so busy trying to make Christmas special and do all the things for all the people, I forgot to remember why Christmas was so special to begin with. In striving to do all the things, I neglected the most important thing. Soon after that Christmas, or perhaps triggered by that Christmas, I entered a long hard season of change and a deep undoing in my soul. I stepped down from a full-time ministry position at our church so I could focus all my time on my family and my own soul care. Like a tree in winter, I was stripped a bit bare. But God drew me close, and that year was a time of important change in my soul as I traded doing good things in the name of God for simply being with Him every day. I took a long, hard look at my habits and I carved out a new kind of rhythm for my soul…a rhythm that was tethered not to the beat of trying to do all the things, but to the beat of the Word of God, daily in my life. And that made all the difference. By the time the next Christmas came, I wanted to redeem the Christmas season for myself and my family. I wanted to strip away all the hurry and the busyness, and focus on what was most important. I stumbled upon the idea of Advent as I was looking for a Christmas devotional. I found The Greatest Gift by Ann Voskamp and started reading it in my own devotions. I quickly fell in love with the daily remembering. I loved the Jesse tree tradition and I wondered how it might look for our family to take a few minutes every day to focus our hearts on Christ and His great big beautiful story. So we started our own family Advent tradition. Each night we read a devotion and added an ornament, printed on our home printer and tied with simple string, to our Jesse tree. We lit a candle and we prayed together. We said no to quite a few invitations and extra things, so that we could make our time together a priority. That Christmas, as we observed Advent in our own imperfect way, something shifted. God used Advent to change my heart and to transform how our family celebrates Christmas. It made the whole season so much more intentional and meaningful. Every day was wrapped with remembering, and with that remembering came an abiding peace. A season that had been known for its hectic rhythm of doing, became for us a season with a slower rhythm of being…being together, being with Christ, being still and simply remembering Him. Our Advent tradition has changed a little through the years. As our girls have gotten older, the calendar has become a bit more of a challenge. Homework and school events and gatherings with friends have increased, so we’ve had to be even more intentional about setting aside time together to slow down and remember. We have missed days and skipped days and fallen behind. Ornaments have been left out and devotions have been overlooked as the rhythm of the world and the long list of to-do’s have crept back into the season and our family over time. I guess that’s the thing about traditions and habits and these rhythms of remembering…if I don’t intentionally and consistently keep recalibrating my rhythm with Christ, it will naturally begin to drift back to the rhythm of the world. Our hearts, because of our broken nature from the fall, are naturally bent away from Christ and His “unforced rhythms of grace” (Matt. 11:29 MSG). I know my own heart gravitates toward striving and doing and perfection…it takes intentional effort to slow and still and rest. So yeah…we are totally not perfect at observing Advent. But I don’t think that’s the point. There is no perfect way to do Advent. And as imperfect as we are at Advent, I still believe it is one of the best things our family does every year. Even if we miss a day or two (or three or five ;) ), it is still more than worth the extra effort to make our time together a priority and take a few minutes as many days as we possibly can to slow down and focus on Christ together. This year has been a particularly difficult year for us. (This is only my second blog post for this year, if that says anything ;) ). The challenges and changes and movements in our hearts have been big and deep and hard and more than a little overwhelming. I’m coming into this season of Advent a bit weary and worn again. But this time I’m anticipating a time of restful remembering as I recalibrate my heart to the rhythm of Christ and the power of His Story. So this year, we will observe Advent again. In our own imperfect but beautiful way. We will set aside time every day to light a candle, read the Bible, focus on Jesus’ story, and pray together. We’ll set up our Jesse tree and hang our ornaments and we will remember and celebrate all the amazing ways that God has written His story throughout history and all the beautiful ways He is writing His story in our hearts even now. If you’re looking for a way to reclaim the Christmas season for your family and let it become a time of restful remembering, I invite you to try starting an Advent tradition of your own. 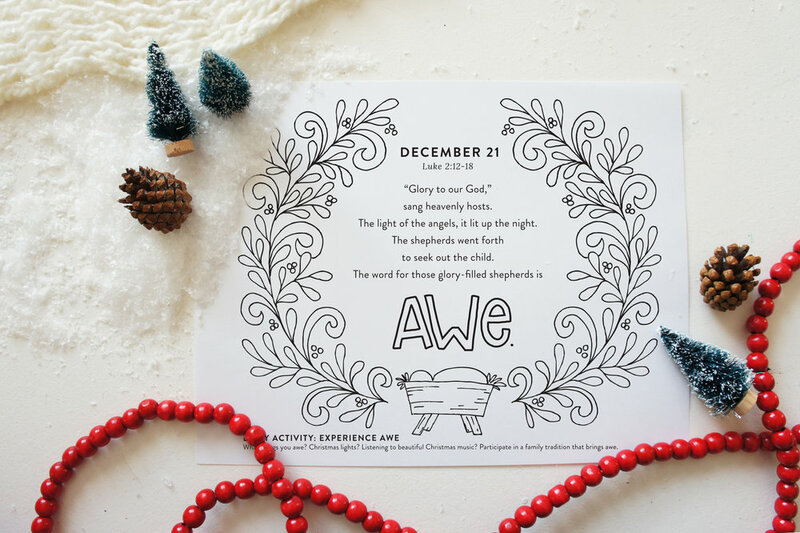 I am excited to share this new Family Advent Devotional!! 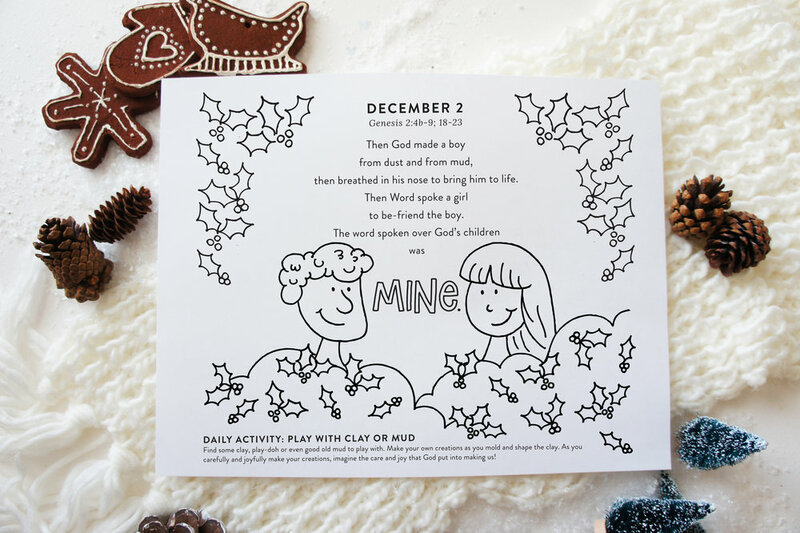 I was so honored when my friend, Dena Hobbs, asked me to illustrate the pages of this Family Advent Devotional that she had written. It was such a fun project, and I’m so happy with how it all turned out! 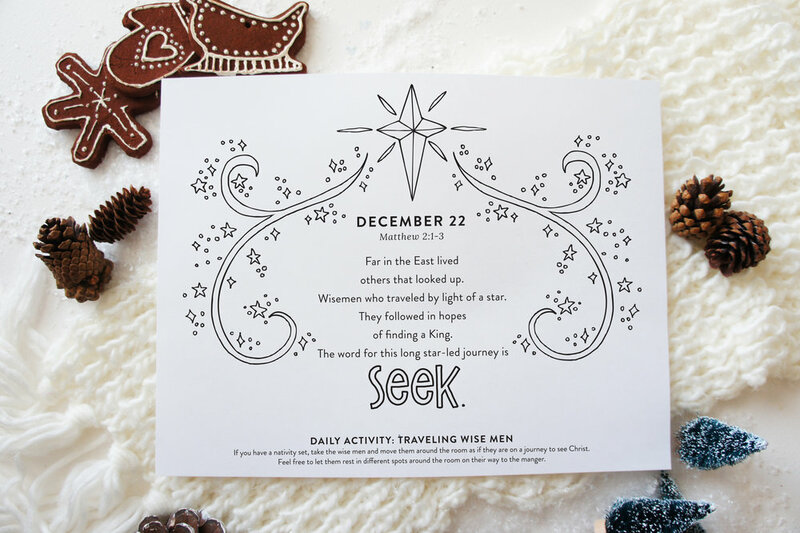 Whether you are new to celebrating Advent, or have a long history of observing Advent as a family, this little devotional is an easy and fun way to incorporate the story of Jesus into your daily rhythms of this holiday season. 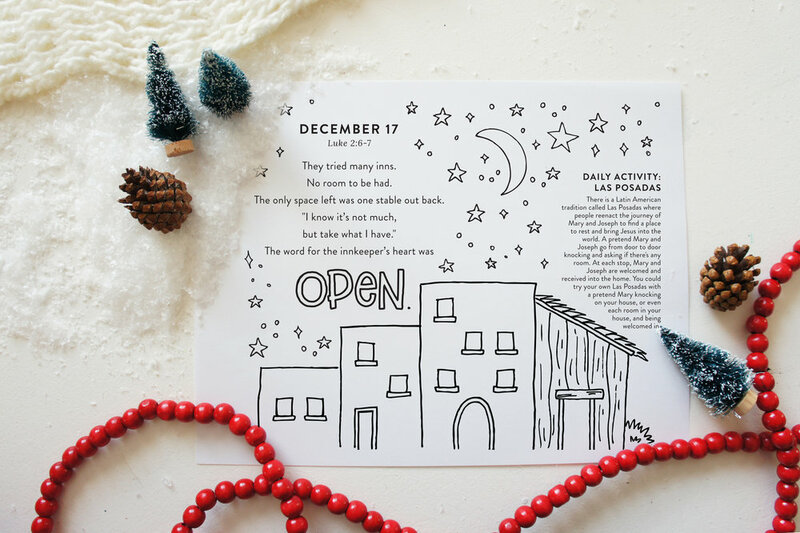 Each of the 25 pages includes a short devotional (perfect for little hearts...and big ones too ;) ), an activity idea, and an illustration to color. There are even tips for binding the pages together to create a treasured keepsake. We are giving away this devotional as our gift to you this Christmas. All you have to do is click to sign up for my email list – or hop on over to Dena’s site and get on her list! And we’ll send it right to your inbox! There are lots of resources out there…and there’s no one right or perfect way to do it. Just start somewhere, with just one thing every day for the month of December, and let God move in and make this Christmas season the best one ever! If you’d like more information about the books and devotionals that we have loved to use as a family, visit www.TheGreatestChristmas.com. 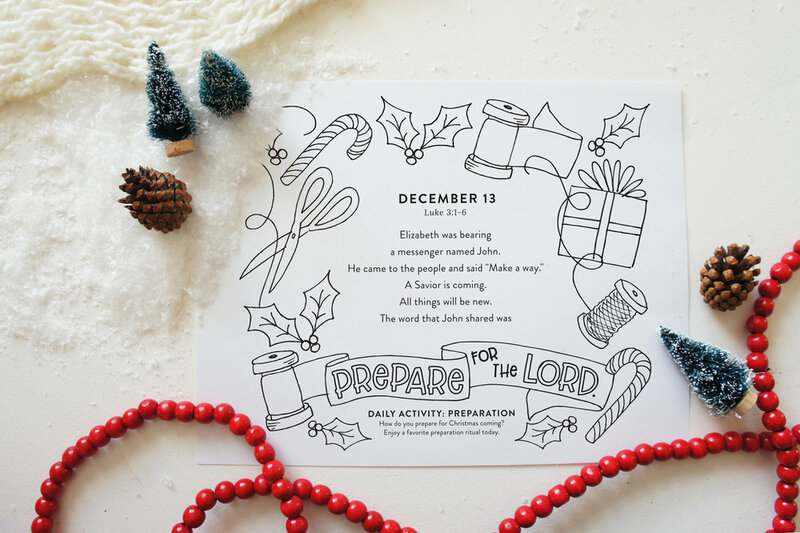 You’ll find links to all the books and resources, as well as free printables and tools to make Advent super special. No matter how you celebrate the season, my hope and prayer is that you will take time as a family to slow down and remember Christ this Christmas. In a world that prioritizes hustle and hurry and the pressure to do all the things, we hope Advent will provide a way for you slow down the pace and prioritize the things that really matter most this Christmas.